Why shouldn’t you love Monday? That was the concept behind our Monster video series, #TGIM--Thank God It’s Monday. Why shouldn’t you love Monday? That was the concept behind our Monster video series, #TGIM—Thank God It’s Monday. 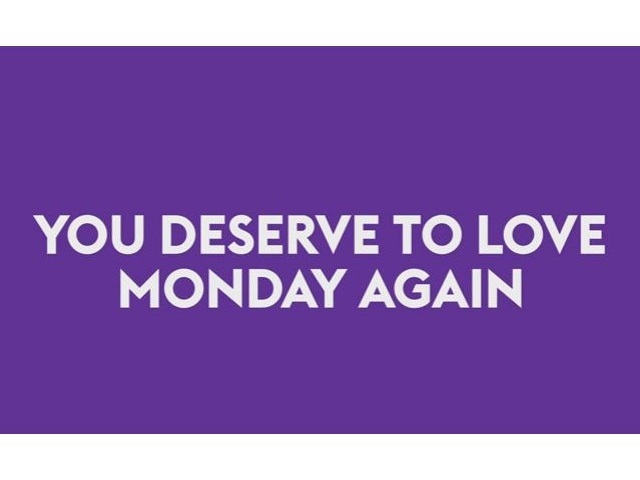 Working with a local improv group, we produced a series of videos capturing people on their Monday morning commute with the message, “You deserve to love Monday again.” It’s a message that’s instantly relatable, authentic, identifiable and sharable. While it’s funny, it makes you think: Could I find a job I love? Our #TGIM series was developed specifically for social channels, but creating a compelling, visual narrative was still front and center for these pieces–even within a 14-second format. Video gives us a way to tell stories that are engaging and relevant to our audience of job seekers, and social channels offer us the right conduit to match these assets with a platform that supports these same pillars. Video is no longer an optional tool for marketers, it’s a must. Last year alone, Facebook more than doubled its daily views, skyrocketing to 8 billion. While video content is a pathway for finding new customers, social video requires a stronger authenticity of voice over traditional TV spots. Video can–and should–tell an emotional story, but the creative approach needs to consider the limitations and flavor of the specific platform: What story can you illustrate in 16 seconds? In 5 seconds? In 60? In that vein, we also created a video campaign utilizing our “Find Better” tagline, which spotlighted people who found jobs they love, celebrating how employees are ultimately key drivers of company success. With these videos, our focus has been to expose the ultimate value proposition of Monster (the outcome of finding an amazing job) rather than just the process we enable–of discovery, application and education. In the campaign, we created one particularly successful piece titled “Allie and Her Truck.” It tells the story of a female truck driver who followed her inner calling for the open road, leaving her role as an information-technology analyst to pursue a career that makes her happy. She had an incredible story that illustrates what we all want–a job that inspires us. We’re bringing to life the end result of a finding the perfect job and the enormous payoff of pursuing “better,” which Allie illustrates beautifully as she travels the country visiting gorgeous landmarks, exploring the world through her work. And most important, Allie and her story are real—no theatrics here. With our “Find Better” series, we put a lot of effort and resources into creating thoughtful, visually appealing video content; these are highly produced segments. With this great content in hand, it’s critical to devise a deployment strategy that amplifies its reach and impact to our audience. At Monster, we engage with our audience of job seekers across more than 20 different social platforms (and growing). With multiple brand channels to manage and different social platforms with different audiences, voices and impact, we’ve utilized social media management platform Hootsuite to schedule all of our content. We’re able to take advantage of its integration with the “big four” video channels—YouTube, Facebook, Twitter and Instagram—to schedule posts at the most impactful times directly from the Hootsuite dashboard. For instance, in a recent blog post, Hootsuite compiled recent survey results from Kissmetrics and other sources, detailing the optimal times to share content on these platforms, based on engagement and clicks. While it’s definitely an art and not a science, the results underscore that after-work hours and weekends can be a strategic window for reaching your audience, particularly a broad consumer base. This is something that most brands ignore, often stopping or slowing posting on the weekends or at night. That’s a mistake.